At this point I also want to thank all the sponsors, Judges and also tech partners who made this event and final challenge happen. For me this challenge was great as I did manage to ‘get my hands dirty’ with the tech and try and show a few things off. Not everything went to plan but it also doesn’t in the real world and you usually have more time! My key things to take away from this as said in the final webcast is always have a pen and paper and documents these in an appendix. Its just like your school exams, show your working as someone in the community or a peer may be able to help you. If you can also invest in a whiteboard to as for me it just helps blow some of these ideas up and gave me more room to move. Secondly don’t be afraid to ask for help… this may be a competition but I found we all started emailing one another for help which I think is fine! The whole reason behind this is to build a community and this all starts with the fact we need to ask and help one another. My design is here and yet not my finest hour vDM Season 4 – Challange 4 – Connecting Clouds – Gareth Edwards but I want to congratulate Katarina on coming 1st 🙂 It was well deserved after deploying NSX in such a small environment and time frame. She must now be the NSX queen! This challenge for me was one of my favourites as although I did get a bit of a slapped wrist from Rene of which was well required to put me in the right direction for the final. But I must say a thank you to him here as I also developed professional from this and went on in my career and in the competition because of it. The bit I liked most is it pushed my into containers at last, although this appeared me be me somewhat misinterpreting the brief as I could have done it more simply I know Eric was glad someone used them in the challenge. It gave me a good view on Docker and also how to automate it of which started a good set of coding basis for the final challenge. It has also made me think you don’t always need to be using the biggest tools set out there as sometimes the open source ones can work just as good if you put the time and effort into them. For me this challenge was not just about the technology we could implement but also what process we could tweak. It also has made me start to consider simple things that are normally overlooked that can be turned on in mine and customer environments over time to try and ensure tracks are left and can’t be swept away. Some of these being simple free options such as AD auditing and W indows File Integrity Monitoring. This has certainly become more prominent to myself by seeing people being compromised by the outbreak of Cryptolocker and this would make things much more easy to isolate the infected machine and/or user account. If I had more time I would have liked to explore more software and also sample some of these in a lab if available. It has made me realise there are many tools I could utilise day to day and in future designs of which some should have made a more prominent appearance in my original submission. It has also made me more aware we can’t always make a knee jerk reaction as this may then allow the person who has compromised our equipment to take action, we need to be as stealthy as they were to get in. We also are yet to figure out if the person is not being forced to take over the DC as they themselves may have been targeted. Maybe there are more survivors than we know and they are also trying to rebuild systems to survive. 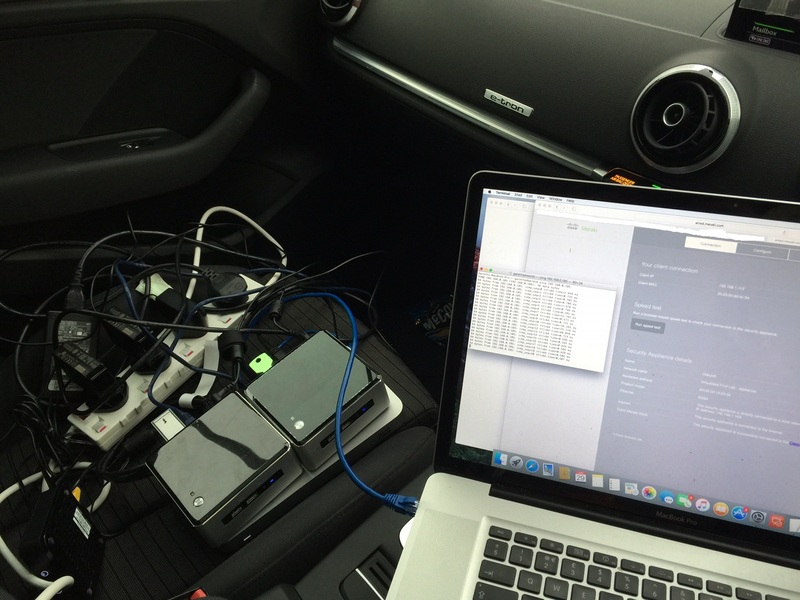 If any of you have read my vDM challenge 1 post you will know that I wanted to create a mini mobile data center on wheels but the twist was I wanted this to be an electric/hybrid vehicle. I also would love my lab to be mobile so I can take this to clients and the fact if I am challenged on this during my defense this evening I can say it works! Whilst conceptual I thought well could or should this work. Only one way to find out I thought, it was a good time to put theory into practice. I know I may have bored a few VMUG people with this idea but low and behold it pretty much worked. I could not test this 100% as unfortunately I don’t have access to a 2nd Meraki MX or Z1 at the moment and my VSAN decided to collapse of which it has never done before. I only know this as I have moved my lab enough times in the last few weeks and its been fine just this time it said no more! First things first we needed to get a Ethernet connection in the car let alone an internet connection. I could have achieved this in multiple ways but due my my car of choice being the Audi A3 E-Tron I already have WiFi on board I just needed to get this to Ethernet. The reason for me personally choosing an E-Tron is the battery capacity is more than enough to get me to work, I have charging points at my office and where I do have a petrol engine I am not limited to range in theory. I am a glorified generator on wheels. Its also quite fun to drive as the power is just there and if you put your foot down you are in for a right surprise. Either way I have digressed so back to getting Ethernet to my firewall. I came across a very nice guide by Chris Harvey that allowed me to utilize my old Sky connector of which was just sat in a drawer gathering dust since going to fixed connections in the house. Now to try this out in the car… At first I thought yeah this will work but lets try my laptop first before I pull my whole lab out. 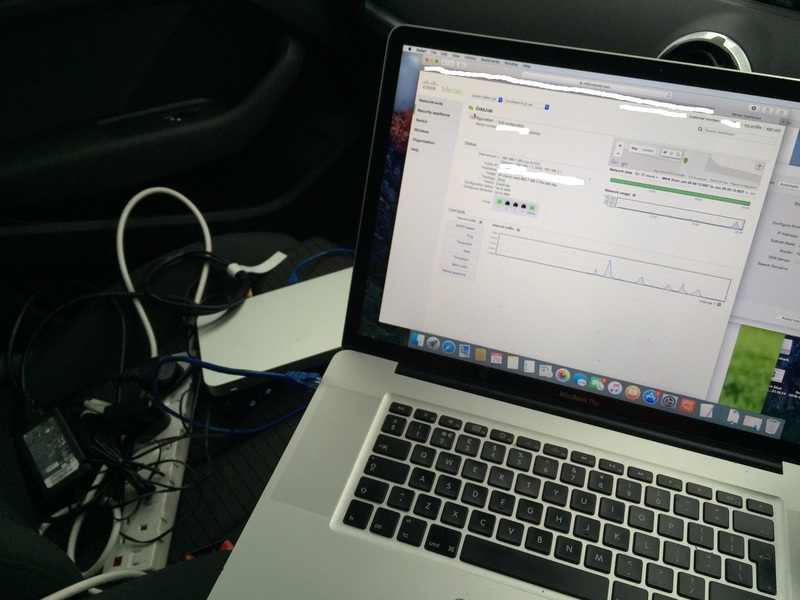 Within 2 minutes of associating the AP with the car I was browsing the web quite happily via my Ethernet port. 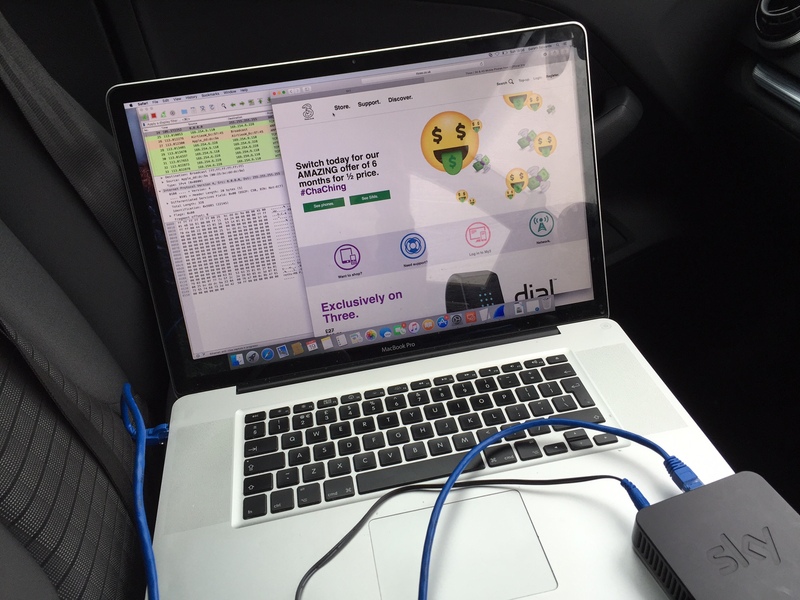 So now the real test that happened a few days later as I wanted to ensure I got the WAF before taking down the house Internet…. 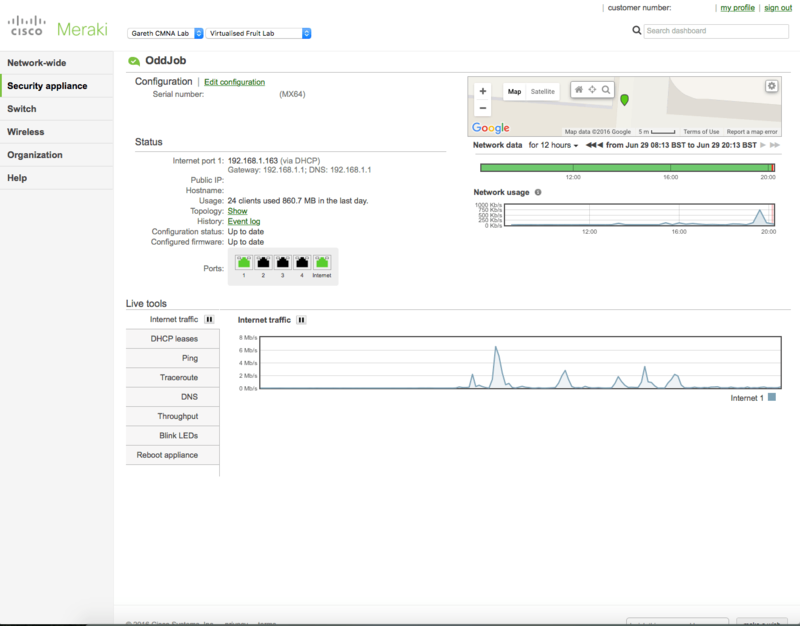 The first test was just the Meraki and again within minutes it was online and showing in the Meraki dashboard. 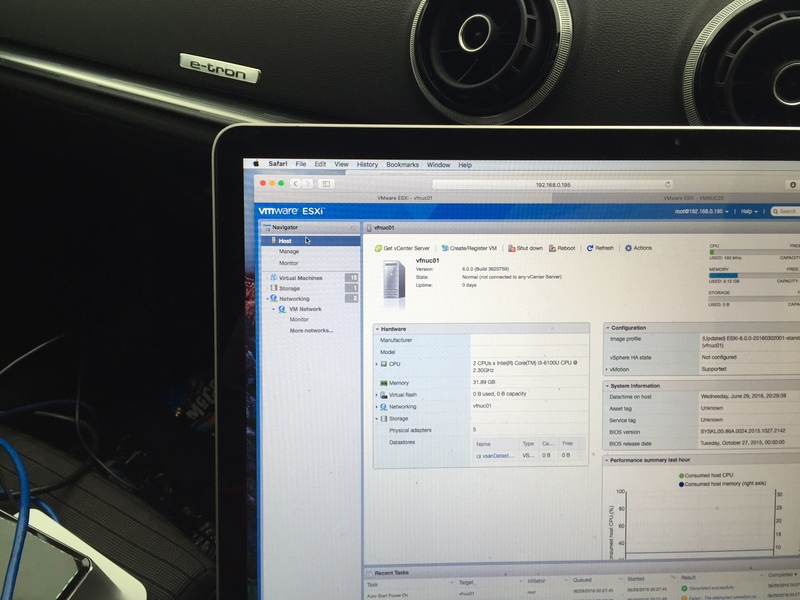 As you can see everything seemed to come up but the VSAN. I am still investigating this and a further blog post will follow but overall I am very pleased as in theory I have a hybrid hybrid datacenter on wheels of which I can charge its 8,8KWH battery by driving it about or finding one of the many free sockets I could then run my DR plan for just the cost of getting there and my data! Firstly this is a great opportunity and I am loving it so far. I should have planned better or at least checked that the weekend it started I at least had 3G as I was camping and no WiFi for miles. The joys of living in the rural part of the UK. Either way I manged to get the challenge brief document downloaded after the live stream. I the proceeded to start my design off told school in my head and on whatever paper I had with me. I am looking forward to the defense part already but I know I will probably choke with only the 2 minutes I have so I hope I have put in enough this time round so I can get through to the next heat. That way I hope I can show off some more skills and learn some at the same time. In regards to my design below if I had more time I would have investigated more networking elements and planned out the VLANs. Due to time constraints I have had to exclude some elements and provide a more high level design in areas. In the next challenge I will ask the judges more questions as I have made way too many assumptions such as processing power needed, having access to the internet and even an email system! I would also prefer to plan out VM placement so I can show the naming conventions and plan for backups/recovery better with justification. I feel I am also missing much of the automation element and its work flows or even demonstrating these at a high level. I also need to learn Docker or Photon OS more. Fingers crossed and lets hope everyone already sent in their submissions in before they read this post! EDIT:- Already on the drive home have I already realised that I have missed a major part to my switch layout and should have more… also I didn’t even think about AV! Let just hope there are no more viruses out there…. time to go cry before the judges questions….